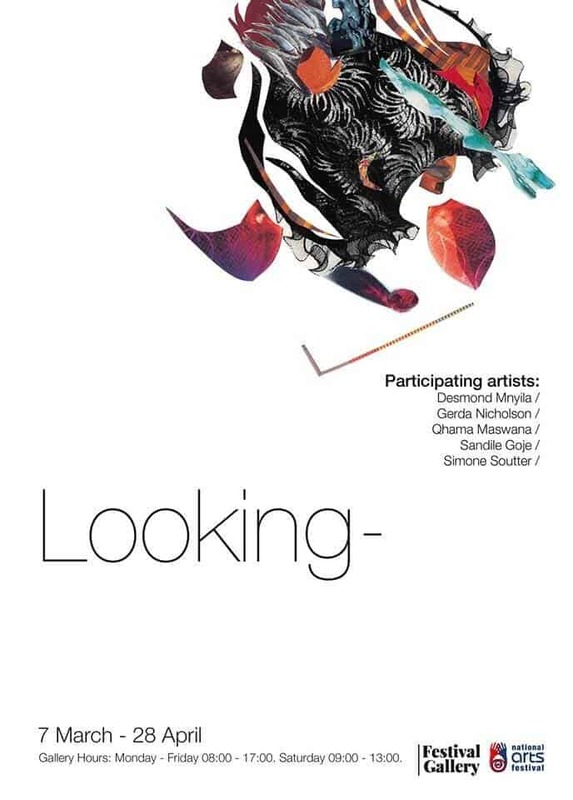 Looking- is a group exhibition featuring paintings and prints by Desmond Mnyila, Gerda Nicholson, Qhama Maswana, Sandile Goje and Simone Soutter. The exhibition was curated by Carmen Ford and Cassandra Wilmot, both graduates of the Rhodes University Graphics and Print department in Grahamstown / iRhini. The exhibition is on view at the recently named Festival Gallery located on the corner of High Street and Somerset Street that includes a coffee bistro. 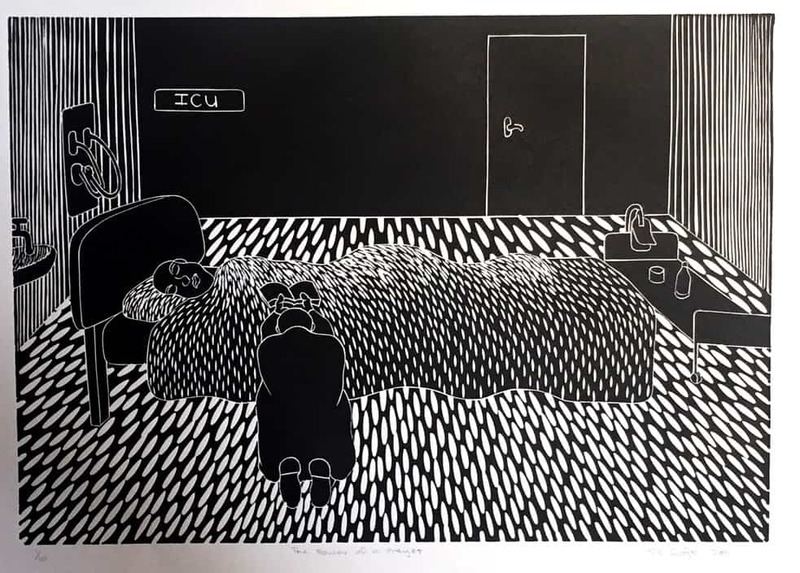 The exhibition includes 5 recently editioned prints by Sandile Goje, whose now famous print; Meeting of Two Cultures was acquired by the Museum of Modern Art (MoMA) in New York, USA. It was printed by the artist at Dakawa Art and Craft Community Centre in Grahamstown/iRhini in 1993 in an edition of 100. Sandile Goje, The power of prayer, 2011. Linocut. Edition 1 of 10. The power of prayer depicts a melancholic and solemn figure kneeling beside the bed in an action of prayer. On the far left wall are the words ICU, an acronym for Intensive Care Unit (ICU), explicitly common to hospital settings. The floor has been carved in a multitude of expressive and vibrant textures. 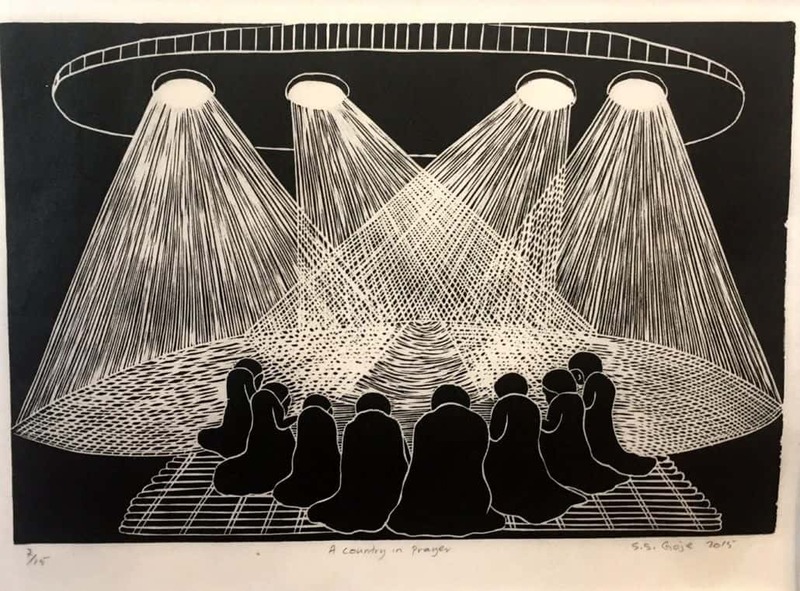 A Community in Prayer depicts 8 kneeling figures in a circular arrangement with 4 spotlights shining from above with what appears to be an unidentified flying object (UFO). 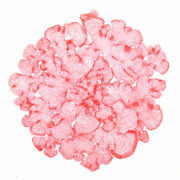 The linocut is carved with a sincere dexterity. Sandile Goje, A Country in Prayer, 2015. Linocut. Edition 2 of 15. Goje’s portrait print, In Memory depicts a female figure kneeling and holding a bouquet of flowers beside a tombstone with the words, Rest in Peace articulated on the head of the tombstone. It is an iconic and emblematic print actualising a period in South African history in a province that has witnessed a transition to democracy from white minority rule to black majority rule, the scourge of HIV/AIDS in an economically disadvantaged province that has had to repair from the effects of the Apartheid homeland policy to a space that now celebrates community, diversity, tolerance and ‘green energy’, including a multitude of scattered windmills, water tanks and solar energy panels. Simon Soutter’s paintings reveal the notion of looking through an abstracted and collaged approach to ways of seeing within a context of mental health awareness and well-being. This painterly approach to image making is a reflection on the mass media consumption evident in the 21st Century, as endless scrolls of images are uploaded on a per second basis onto image platforms such as Instagram. International Congolese Sculptor presents first solo exhibition with Beaux Arts... LOVE?